Martha Wash has been a musical inspiration for countless members of the LGBTQ community. As long as there is a gay pride float or a reason to celebrate, honor and respect all individuals with a song, Wash has been and will continue to be the go-to gal with a voice to elevate the human spirit. You see, whether it’s raining men or everybody dance now, Wash has taken a lot of our history to heart. Wash has been part of the culture for 35 years, since she sang back-up with Sylvester in the late 1970s as part of the duo Two Tons of Fun (with Izora Armstead). In 1982 they had a major hit with a song that is now a classic: “It’s Raining Men,” which led them to change their name to The Weather Girls. They disbanded in 1985 when Wash set out on her own, both as a solo artist and collaborating with the Italian house music group Black Box and the American C+C Music Factory. Yet because of her size, she was not seen in the videos of the Black Box hits “Everybody Everybody” and “Strike It Up,” as well as “I Don’t Know Anybody Else;” or receive proper accreditation for the lead vocal on C+C Music Factory’s “Gonna Make You Sweat (Everybody Dance Now).” Wash was so perturbed by this lack of recognition that she sued and successfully won a lawsuit for royalties and credit – a case that led to a change in the industry in terms of vocal credits on CDs and videos. Her first solo effort in twenty years, what makes the CD different is that it isn’t a dance album. Instead Wash works in the adult contemporary genre in this set of songs. Here for EDGE Media Network, Wash shares her musical know-how, the new songs on the set and how she dealt with her own “rainy day” of life’s challenges. Mark my word though, the forecast is full-speed ahead and sunny skies deservedly so for Martha Wash. EDGE: What provided the inspiration to release this new album? Martha Wash: Well… no definite inspiration, I think it was just time [chuckle] that I release some new music. It’s been so many years. My manager was telling me,’You need to do a new album. It’s been long enough.’ And I said, ’Okay.’ I think I had gotten a little too comfortable. ’Yeah, you’re right.’ You know. So, we just started moving in a different direction musically because I’ve been doing dance music… it seems like all my adult life. As you get older, you kind of decide you want to make changes and go in a different direction and try something new. This album is more adult contemporary. EDGE: Oh, it’s still got some feistiness though. Martha Wash: (laughter) That’s a good thing. EDGE: Every song on this has a strong impact in a positive way when you really soak up the lyrics. I noticed that right off from the very first listen. Personally, I can already hear a couple of the new songs done up in a wonderful dance remix. Martha Wash: Mmm hmm. Here’s what. Usually after folks hear it, they say ’Where is the remix?’ Well… there may or may not be a remix. What I wanted to do was ’showcase’ this kind of music in its simplicity because as well as remixing it, you can also strip it down. You could have different versions of doing these kinds of songs and stuff. EDGE: It shows a softer side of your voice too. Martha Wash: I’ve always been the kind of artist that I wanted to be able to do any kind of music that I wanted to. Most people know me for the dance music and that’s fine. I can do basically dance music standing on my head but I wanted something a little bit stronger and a little bit different. I think the fans who have been supporting me all these many years, know that I can do different types of music. Yet, I want to also appeal to the masses. EDGE: It’s also refreshing to hear something that doesn’t musically thump you in the head. There is an ambiance to ’Something Good’ that is very mature. Martha Wash: Exactly. That’s what we were aiming for, the songs are songs that kind of uplift you, inspire you and possibly… songs that you can take and make ’anthems’ for your life. EDGE: Speaking of anthems all right, ’Proud’ is my favorite on the album and you perform it so beautifully. I thought that any diva with a heart should do this song. Will you tell me the backstory on this song? And you know, if you listen to a lot of music, you’ll find that you like one particular song and another particular song on the same CD… the following week! That’s kind of the fun of it. You have your favorites for that moment or you listen to another track and then you like that one a little bit better now. (Laughter) You may play that particular song for a whole week! I think that’s the good thing about music. slug>EDGE: Definitely. I don’t know if anyone has called you this before, but you are sort of the ’Olivia de Havilland’ of the recording industry. Martha Wash: Oh my goodness, interesting. EDGE: The correlation is what she did with the fact that any time a studio player didn’t want to do a film, the bosses tacked on time to your contract. Your stand for being credited in the industry and the stigma of the weight being an issue in your career… what inside made you fight for this law of ’credit’ due to every singer? You fought for the right of all recording artists to be credited when performing on any song. Martha Wash: Well, let’s see. You know what? I went through all of that stuff and it hurt for a little while. Basically, I had to keep on moving. I couldn’t stay stuck. That whole ’drama’… time had passed and now look, it’s been a little over twenty years. All that time, I’ve always kept working. I just didn’t have a record deal. With the resolution of Black Box, I was signed with RCA. Since I was the one behind all this stuff, why don’t we give you a contract? That’s what they did and I recorded two solo CDs on RCA. Then after that, went over Logic Records and did a couple of things there. I’ve always thankfully been able to work. After Logic closed down, there was nothing going on and no one wanted to sign me… so, I just kept on working. EDGE: When did you start your own record label? Martha Wash: That was in 2000 and it’s Purple Rose Records. Now, off [’Something Good’] ’I’ve Got You’ is the first single. It’s a great, great song and a great video. An award-winning guy and Spanish cinematographer by the name of Ruben LaTray, did the video for that and it’s gotten a great response. So far, the response for the whole album has been generally good. We’re independent people and sometimes it’s hard to get it out to the masses, as opposed to being on a record label. Sometimes, even the fans say, ’I didn’t know Martha Wash had a CD out.’ Oh, yes I do! EDGE: Who would you like to do a duet with? EDGE: I hear a bit of Roberta Flack in your voice too. Martha Wash: Interesting. I like Roberta. EDGE: Well… this is your year. Martha Wash: Yes. This is my time. 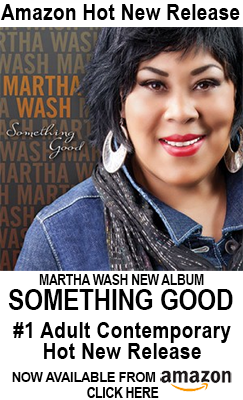 Martha Wash’s new CD Something Good is available online at www.marthawash.com and www.amazon.com or on Facebook under “Martha Wash” and Twitter at twitter.com/Martha_Wash.